Cereal grains and other major food crops can become contaminated with mycotoxins, which are naturally occurring toxins produced by mold that grow in certain conditions. Some of the mycotoxins familiar to the grains industry include Ochratoxin A, Deoxynivalenol (DON) and others, which are not only regulatory and international trade concerns, but also potential health issues. Mycotoxins can develop at various crop stages, pre-harvest, harvest and in storage, but cannot be detected visually and have no taste or smell. 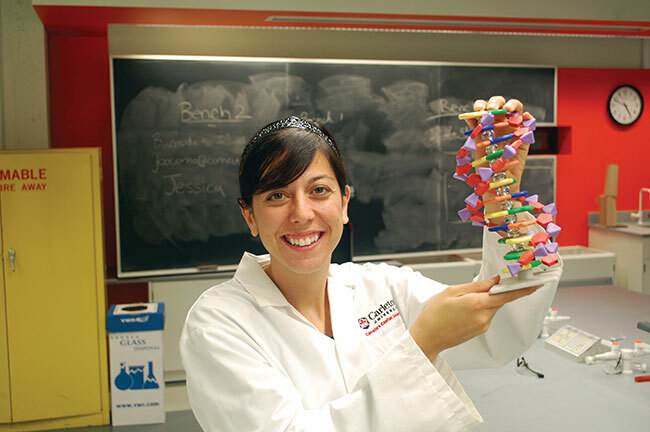 Professor Maria DeRosa working in her lab at Carleton University. A quick and inexpensive visual test for mycotoxins. Recognizing that testing crops and foods to ensure low levels of mycotoxins is a difficult and often expensive undertaking in laboratories, industry is looking for simple, inexpensive tools to detect and screen for mycotoxins. Maria DeRosa, professor and research scientist at Carleton University, is leading a research project developing quick low-cost tests for mycotoxins that could be used at the farm or grain elevator with minimal training or resources. In particular she is working on a prototype to test for Ochratoxin A (OTA), one of the most abundant food-contaminating mycotoxins, which is found in cereals and cereal derived products, as well as other commodities including coffee, cocoa, wine and spices. This mycotoxin can cause health problems in humans and animals, such as kidney damage and potential human carcinogenicity. DeRosa’s first mycotoxin project focused specifically on OTA mycotoxin in agriculture crops, with the goal to try and develop an inexpensive but robust method of detection. A search through millions of pieces of different DNA resulted in successfully finding an aptamer that would stick to OTA. Using nanotechnology and different particles that glow or change color depending on the environment, researchers were able to determine this technology would work for the detection of OTAs. 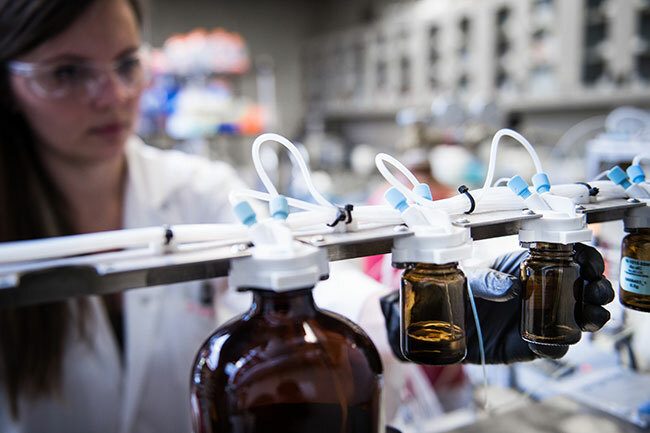 Metal nanoparticle based colorimetric assays have received considerable attention due to the low cost, simplicity and convenience of these methods. 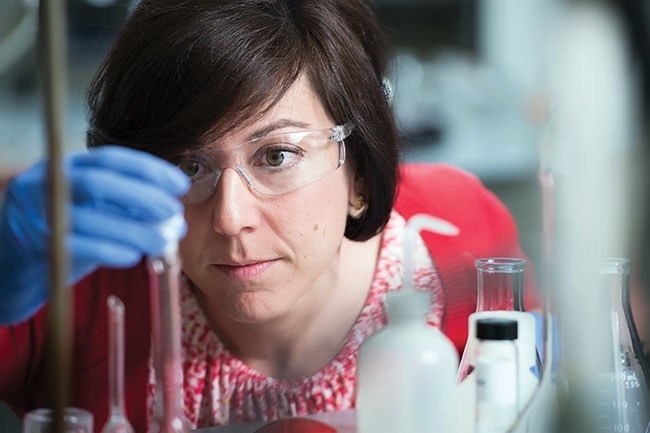 Professor Maria DeRosa working in her lab at Carleton University. Other potential advancements to the test strips could include improving the sensitivity of the test strips to be able to detect specific levels of mycotoxin contamination. DeRosa has also been in discussion with computer scientists about the potential for developing an app that could provide more advanced visual assessment beyond what the human eye is able to see. She is also looking at extending the technology to other mycotoxins of concern, or perhaps even test kits or other tools that could identify multiple toxins at one time in specific commodities. The goal is to design a versatile system that can be used to develop multiple tools and technology to address industry problems in the field. The research has been funded by the Western Grains Research Foundation (WGRF), Alberta Wheat Commission (AWC), Saskatchewan Wheat Development Commission (SWDC) and Natural Sciences and Engineering Research Council of Canada (NSERC).